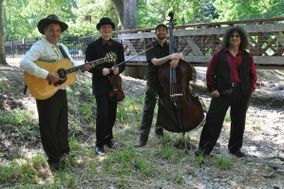 We loved having the Pine Needles play our wedding reception in the redwoods at Sanborn County Park in CA. Josh was very responsive and incredibly easy to work with, and everyone in the band was just so nice. And, they play great music! I only had two song requests from their song list and then asked them to keep things going, and they did a great job putting together a 2 hour set (with a 5 minute break mid-way). We had several opportunities to kick up some dust, and when I wasn't dancing I was talking with people about how great the band was. They also learned a new song for our first dance, did an amazing job with it, and it's a memory I'll cherish forever. My husband and I struggled with the sheer expense of wedding planning generally and at one point had reduced the "band or DJ" argument to "f** it let's just get an ipod and some speakers" for our daytime park wedding...I am so glad that we reconsidered and found these guys because they really did make the day so unique and special. The Pine Needles played at my wedding and were just what we hoped. We asked them to play more of their bluegrass/country songs and were so pleased by the set list and their sound. We love music so were quite choosey with who we wanted to hire, and they proved to be top notch musicians, very far from the "wedding singer" variety that we wanted to avoid. They brought a wonderful sound and ambience to our reception dinner, and then brought our guests onto the dance floor with some livelier numbers afterwards. The Pine Needles played for our wedding, and they did a wonderful job! They learned many special songs just for us, and brought a lot of life and personality to both our ceremony and reception. All of the band members are very genuine and kind, and we really enjoyed working with them. They made our day very special! They were great. If you are looking for a jazz/bluegrass vibe this is your band. My guests and the venue staff could not stop raving about them. They have a solid sound, have great energy, and love playing together. I couldn't have been happier. The Pine Needles music and style spanned all the generations at our wedding perfectly. We had a couple of kids under a year up to people in their 80's, and all ages in between, and everyone loved them! (My bride and I were surprised that the young kids were so quiet, and we attribute it to the band) I heard over and over again from our guests how much they enjoyed the band, and was asked numerous times where I knew them from, etc.... I found them by searching for them, and a couple of e-mails later we had a contract with them. They knew exactly how to bring a festival atmosphere to our Wedding day. My husband and I would like to thank the Pine Needles for the excellent job you did at our wedding ceremony last month (23rd). The music suited our wedding perfectly and I believe my dad was so impressed he bought a few copies of your CD. Unfortunately for me, you did such a good job of "Spanish Harlem Incident" that I am crying on all of my wedding photos! The Pine Needles were were amazing in every way. Josh communicated with timely responses to all of our questions beforehand, and it was done with such ease. The band is off the charts good! If you're looking for any amazing string band that can play most any genre of music, then these guys are for you! Incredible musicians, all of them. We can't recommend them highly enough. Thanks guys!! The Pine Needles are a fun-without-pressure-of-feeling-stuck-in-the-80s acoustic bluegrass, jazz, and contemporary band, and they added a much welcomed lively-yet-laidback mood to my ceremony and reception. All of my communications with Josh were direct and clear, and I appreciated that the band learned a few new tunes for our special day, including "Somewhere Over the Rainbow," "You are my Sunshine" (just the chorus), and "Heaven." The Pine Needles performance at our wedding was fabulous. We could not be happier with how they made our wedding day so special. They were an integral piece to the overall success of the day. They played a perfect mix of classy, jazzy, stringy musical delight. They were on point from Dawgz Waltz processional to their original A Ton of Fun recessional. The violinist/fiddle player was awesome and learned my brides request for bride processional and played it beautifully. They really were just amazing now that I try and reflect on the musical side of the day. They played cocktail hour wonderfully and again were just the perfect fit for our style. Our first dance songs and parent dance songs were great. Just really special to have such professional musicians hand playing music for you and your guests. Hats Off to the Pine Needles! We can't thank them enough. Listen to their music and their style of play and if it's remotely what you're looking for book them fast. Josh is great to work with and they are truly an incredible value. We cannot recommend them highly enough.